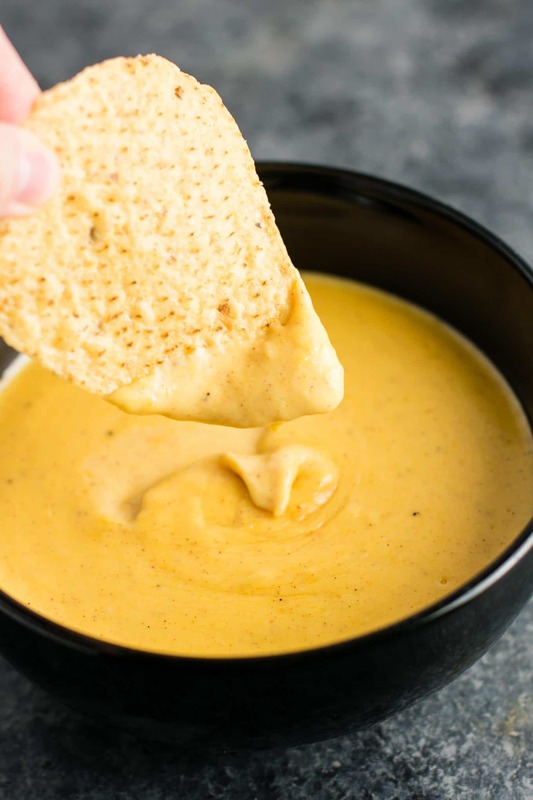 5 minute nacho cheese sauce – the answer to pretty much every problem you’ve ever had. Ok, maybe not really, but it’s definitely going to be the highlight of your meal! Ideal served with tortilla chips, or over nachos – but I could totally get down with drizzling it over roasted vegetables or just about anything. First, add the heavy cream to a pan and warm it to medium heat, but do not boil. Once your heavy cream is warm, add paprika, chili powder, garlic powder, cornstarch, and freshly grated colby jack cheese. Stir or whisk the cheese sauce often for three to five minutes, until thick. The longer you stir over low to medium heat, the thicker it becomes. 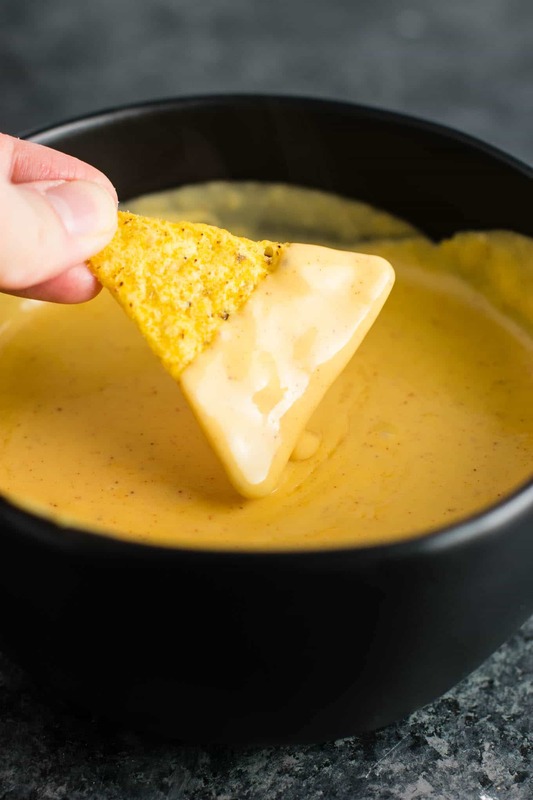 Pre shredded cheese is not the way to go for this recipe, as fresh just tastes so much better and makes a big difference in the quality of the nacho cheese sauce. For a super thick sauce, just leave it on the heat a little longer, watching and stirring so that it doesn’t burn. 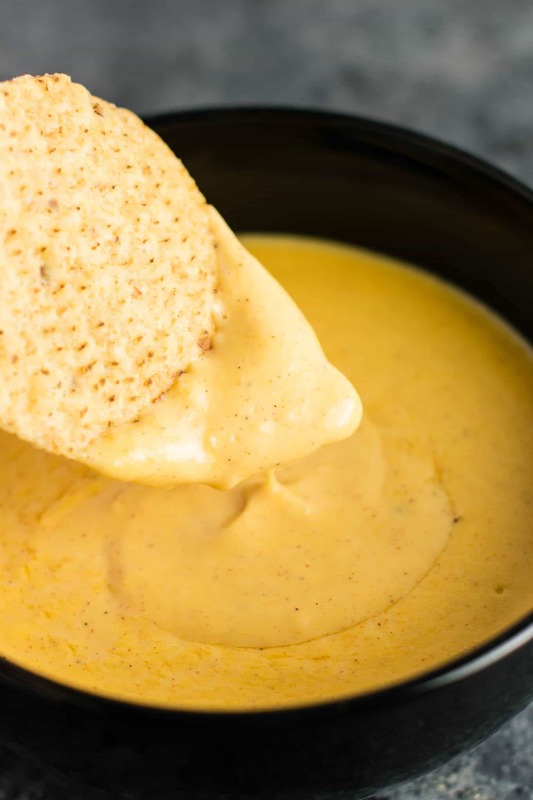 This nacho cheese recipe is similar to my cheddar cheese sauce recipe , but made with colby jack cheese and mexican spices to create a nacho cheese flavor. The answer is simply: cornstarch. By using this as a thickener, you spend much less time and the taste is just as good! 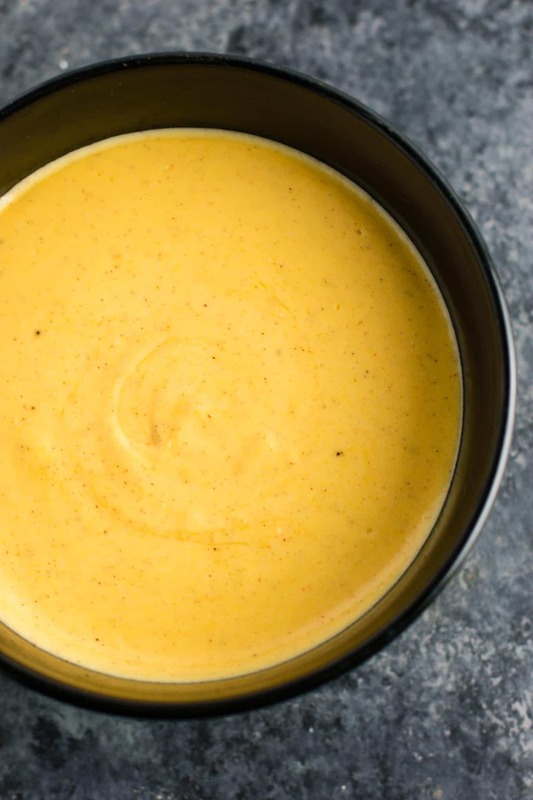 Once I realized the cornstarch trick, I make all of my cheese sauce recipes this way! 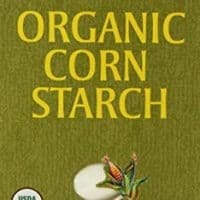 Cornstarch is now a time saving staple in my home. You can’t taste it, and it makes dinner time a heck of a lot easier. Once we first made this recipe, I had to make it three times in one week because I just could not get enough of it! 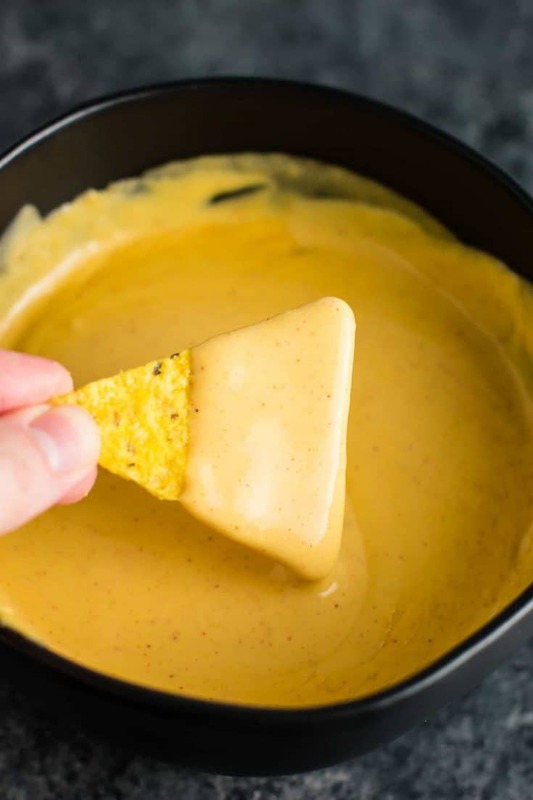 The homemade nacho cheese just takes nacho night to the next level. Fair warning: it might forever spoil you on nachos! It literally takes five minutes to make and tastes so good I really can’t even prepare you for the deliciousness. Since first posting this recipe, I have made this countless times and even served it at a party. From easy dinners to party appetizers, you really can’t go wrong with a batch of this cheesy goodness! It reminds me of going to a mexican restaurant and filling up on chips and cheese. I could totally do that with this recipe! Heck, just give me a bag of tortilla chips and I’m good to go. If you’ve ever wanted to drown yourself in a vat of cheese, you feel me. 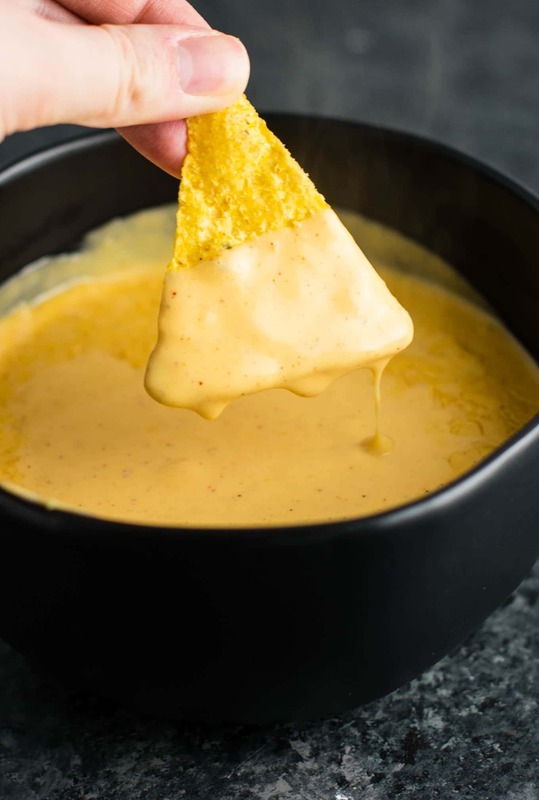 I love this cheese sauce plain with tortilla chips, or drizzled (very) generously over whatever mexican dish we are having that night. Robbie and I easily finish off the whole batch every time we make it. It’s hard not to! 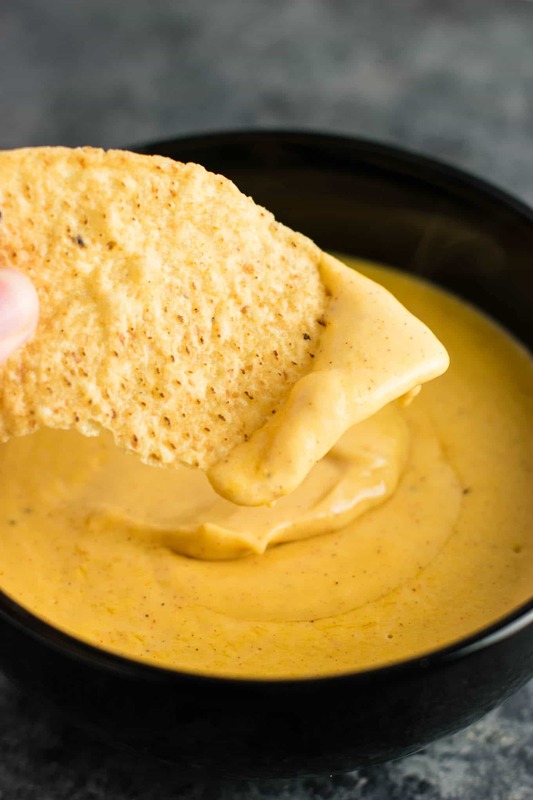 You can’t resist how delicious this nacho cheese is. I’m only sad I didn’t discover how to make it myself at home sooner! I find colby jack perfect in this recipe, but if you wanted to use another cheese (think sharp cheddar, pepper jack, etc) you totally could. Or, if you like spicy sauce, double the paprika in this recipe for a spicy nacho cheese or use pepper jack cheese. I definitely plan on making a white cheese/queso blanco sauce based on this recipe in the future. Here’s my favorite way to serve it: drizzled oh so generously over my 30 minute sweet potato refried bean nachos. Robbie and I can single handedly finish the whole sheet pan of nachos ourselves. 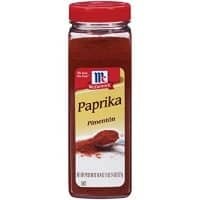 No matter what type of nachos you are making, this sauce would be the perfect complement. Serve it up at game day and watch everyone devour it in seconds. Are you making this recipe? I want to see! Don’t forget to tag me on instagram @buildyourbite and hashtag #buildyourbite. Or check out my roundup of 26 vegetarian mexican recipes! Did you make this recipe? I would love if you left a star rating below! 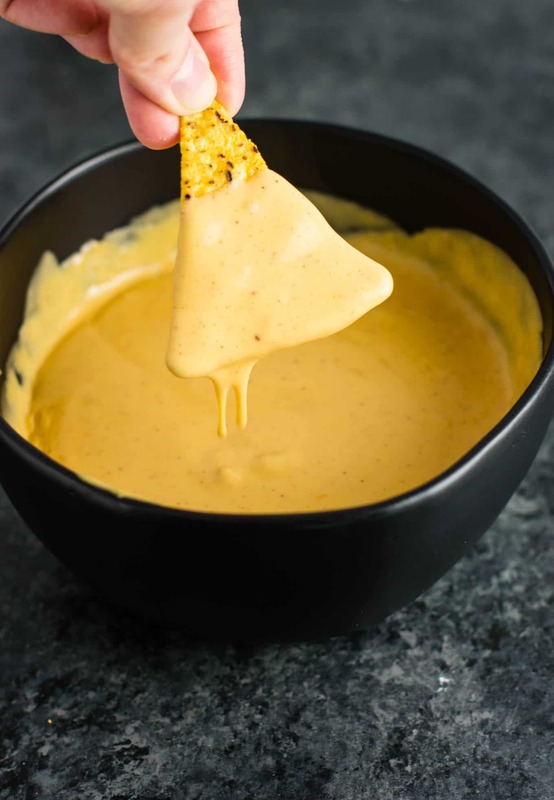 The easiest 5 minute nacho cheese sauce made with no flour or roux. You will never go back once you taste this! How did this recipe get reviews and stars if the reader can’t see them? Due to a glitch with my recipe plugin, readers were able to leave star reviews without a comment attached. This has now been resolved. This recipe has also been reviewed on Pinterest as well. I want to serve this at Super Bowl this Sunday. Will it hold up if I put it in a small crockpot on warm? Yes that will work. It will need to be stirred to avoid it getting too clumpy. You could also add a little milk if it gets thin. I would suggest doubling the recipe if you want to serve a crowd. I have kept both this recipe and my healthy crockpot queso recipe on warm with good results. Hope that helps! Hi! Can you tell me How long can i keep it in refrigerator?? It should keep for 2 – 3 days in the refrigerator! Does it get hard when it cools down to room temp?